Notepad Corner: Why Haven’t More Homes Switched Over to Combination and Digital Locks? Why Haven’t More Homes Switched Over to Combination and Digital Locks? Why Haven’t More Homes Switched Over to Combination and Digital Locks? Before the 1970s, the Swiss completely dominated the world in wristwatch sales. In the early sixties, fearful of losing any market shares to new and cheaper battery-powered watches, a group of Swiss engineers banded together and developed the first quartz wristwatch in 1967—the Beta 1. A conglomerate of Swiss watchmakers, however, decided not to pursue the new technology. By 1968, Seiko introduced the world to the first production quartz watch. It was an instant success. By the time the Swiss saw the error of their ways, it was too late: the Japanese companies would forever take larger and larger shares in a market that had once been literally synonymous with Switzerland. There is a simple explanation for why this happened. It wasn’t for lack of technology or ingenuity. It wasn’t because of economic factors or a shortage of financial resources. It was entirely due to clinging stubbornly to the past. Sociologists call this resistance to a shift in paradigm. To the Swiss, the paradigm (model) of a watch was one with a lot of precision gears and delicate springs, not batteries and circuits. This same resistance to change can be applied to the home security and door lock industry: keyed tumble and lever locks remain the predominate choice of homeowners. Therefore, if the paradigm is to ever shift toward more secure and reliable combination locks, then the industry must address why resistance to change persists. Much of the resistance is attributable to one thing—misinformation, which when firmly planted becomes very hard to uproot. What ideas about keyless locks, then, are wrong, or at least are no longer true? Well, there are at least three false notions that stand out as obstacles to change: safety issues, appearance, and inconvenience. The perception that keyless locks are somehow less safe is possibly due to their being grouped in the same category of the electronic swipe card found in nearly every hotel around the world. It is true that electronic swipe card mechanisms are easily susceptible to hackers, but no homeowner or homebuilder would ever install a “hotel” type system in place of even the cheapest keyed lock. The second issue—appearance—is simply no longer a valid reason for not switching over. There was a time when there was little choice among the styles and looks of lock systems other than standard keyed systems. They were large and bulky, i.e., unsightly mechanisms that clashed with the existing décor. Today, however, alternative lock systems have gotten sleeker and smaller, and there are dozens of designs and finishes to choose from to suit most any taste. The third idea that keyless systems present more of an inconvenience is simply false and never should have been allowed to take root. Most all systems can be readily installed using the existing holes and slots in standard manufactured doors—with no additional installation fees. “What if I forget my combination?” and “What if I’m incoherent and hospitalized and can’t communicate my combination to someone so they can get in my house?” are two concerns of inconvenience that are also commonly voiced. First of all no one forgets their bank PIN or their email pass code after a few trials. So, why would it be any different for a code that is used multiple times a day? Second of all, when is there ever a situation in which an incapacitated person doesn’t have a friend, family member, or neighbor who already has access to the home? Even if codes are forgotten or inaccessible, any decent locksmith can override the system. Many people also falsely believe that power outages and disasters such as hurricanes would be an inconvenience, too. What they don’t understand is that most combination locks are not electronic, and that nearly all digital ones that are, are self-contained and independent of the home’s electrical system and not affected by power outages. A fourth obstacle slowing down any shift toward keyless locks—high cost—is unfortunately and largely still true. 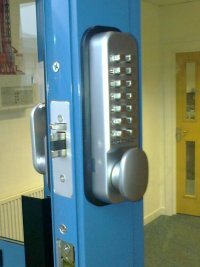 Though prices in recent years have gone down, the average cost of an alternative lock system is anywhere from three to five times more expensive. If home builders started installing them as standard features in high-end homes, the cost would be absorbed by the initial buyer. Until then, however, making a shift to keyless locks must rely on industry insiders to be proactive and re-educate the public. Dan Muston, a professional locksmith for 10 years, is intrigued by safety, locksmith work and security installations. Aside from creating articles about the locksmith profession for web and blog sites, Muston maintains the growing social media presence of DandLock, a professional locksmith company servicing Arizona, California, Florida and New York. Reach out to Muston via email at: dan.muston77@gmail.com.